Do you share a lot of updates on Google+? Want to make it easier for followers to pick and choose their favorite topics? Google+ Collections allows you to categorize your updates by topic, which helps your followers quickly find updates for the topics they’re interested in. In this article I’ll show you 11 ways to use Google+ Collections to organize updates from your personal profile or business page. 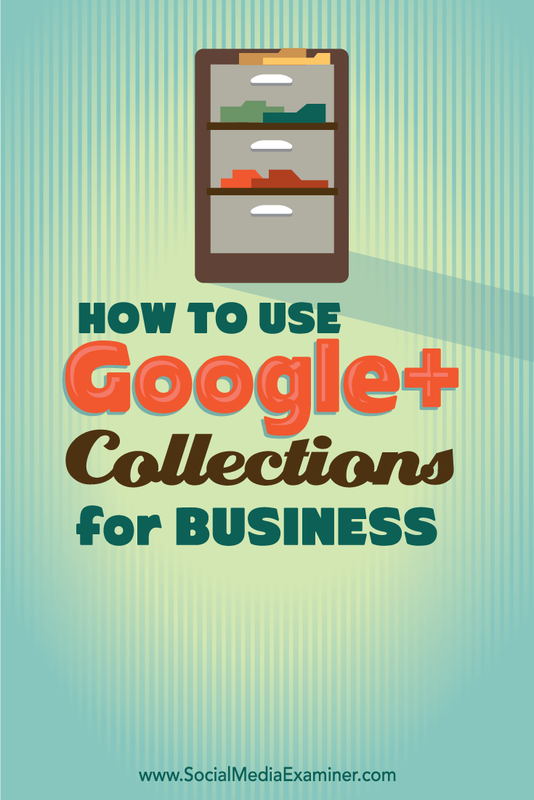 Discover how to use Google+ Collections for business. Does your Google+ page share a lot of valuable tips? If so, organize them into collections like the Google Webmasters page does. 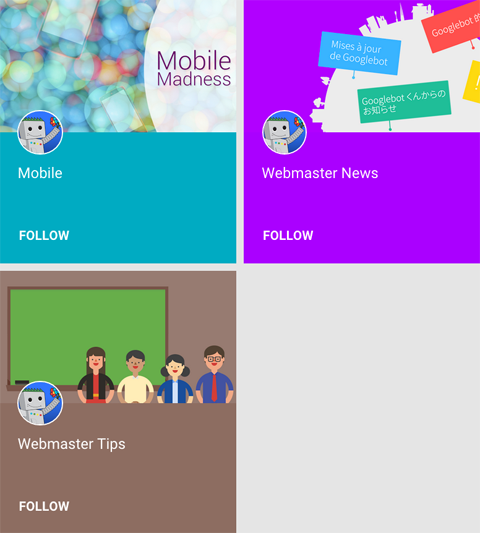 The Google Webmasters page created a collection for their tips. 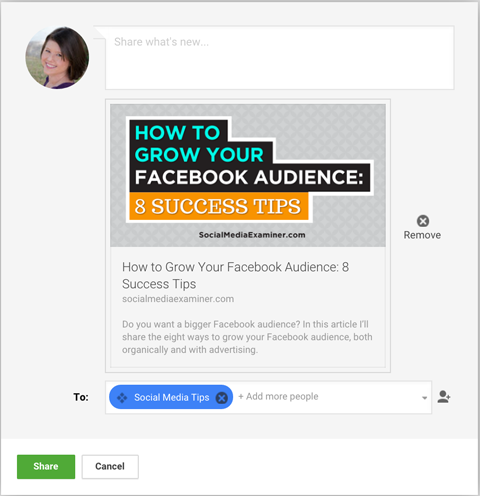 Collections give your Google+ followers a preview of the kind of advice they can expect to see from your page. If you participate in specific campaigns, like nonprofits do, you can use Google+ Collections to document those campaigns. 1 Billion Acts of Peace does this with collections about their launch and individual missions. 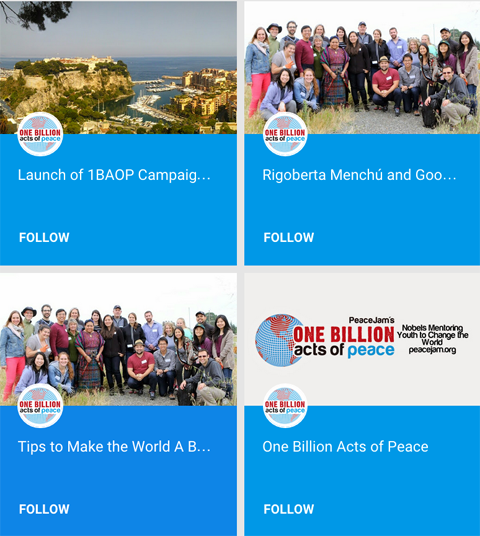 1 Billion Acts of Peace has collections for its campaigns. These collections show your Google+ followers what campaigns your organization runs and how they can be a part of those campaigns. 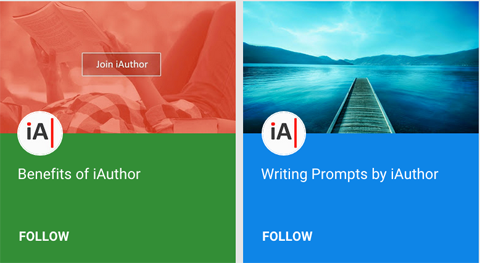 If you share lots of great ideas, Google+ Collections can help you organize them. Brit + Co encourages their followers to be more creative through their collections of ideas. The Brit + Co page has collections for different categories of ideas. 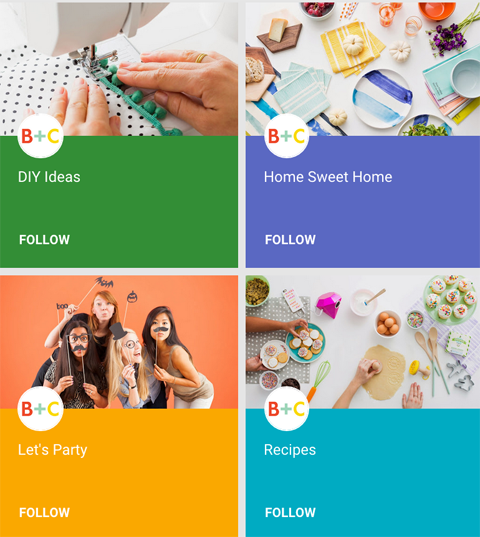 These collections help followers find ideas that fit the things they enjoy doing, whether it’s crafts, hosting parties or cooking. Google+ pages for places can use collections to highlight the best things to do in a specific geographic area. The site visitlondon.com highlights things to do, times when the city is in bloom and notable landmarks to visit. visitlondon.com’s page uses collections to highlight information for visitors. 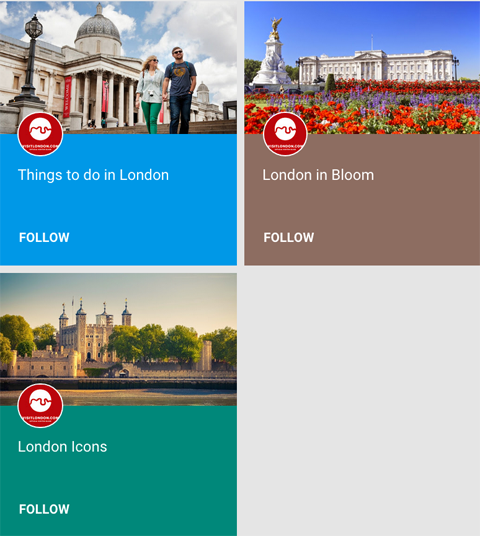 These collections allow followers to quickly find updates about the things they want to do when they travel to London. If your business sells products by offering related freebies, you can use Google+ Collections to categorize those freebies. 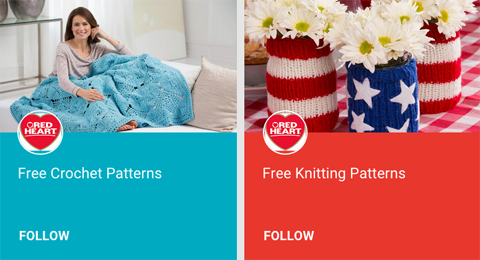 Red Heart Yarns does this by offering free crochet and knitting patterns on their Google+ page, all of which are likely to lead to followers purchasing their yarn. The Red Heart Yarns page has collections for freebies. These collections direct the company’s followers to the exact freebies they want, and ultimately to purchasing the products to complete these projects. There’s nothing wrong with promoting your business while sharing valuable content. iAuthor uses collections to separate posts about their platform from their useful tips for specific audiences. iAuthor uses collections for company-related posts and helpful tips. These collections guide iAuthor’s followers to more information about the business or to the tips that will help them most. Does your business offer different types of products and services? 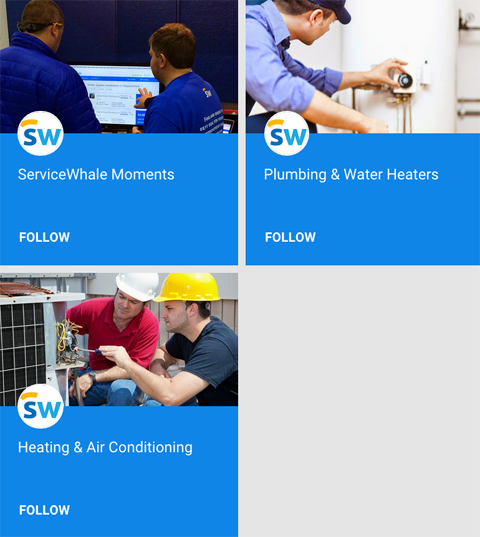 ServiceWhale classifies different offerings with their Google+ collections. ServiceWhale’s page uses collections for different products and services. These collections make it easier for followers to find the specific services they need. They also lead them to testimonials received from happy customers. Your business has customers at all stages: potential customers, current customers and former customers. Capri Laguna uses their collections to organize content for customers at each of these three stages. Capri Laguna has collections for different customer stages. 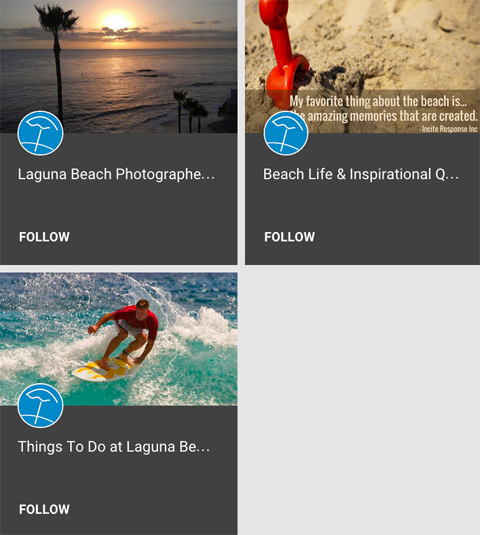 These collections give Capri Laguna’s followers inspirational content to entice them to come to the beach, find things to do while they’re there and reminisce after they leave. If your business offers many amenities to your customers, you’ll likely want to showcase them. Hyatt does this through their collections. Hyatt’s Google+ collections are organized around hotel amenities. 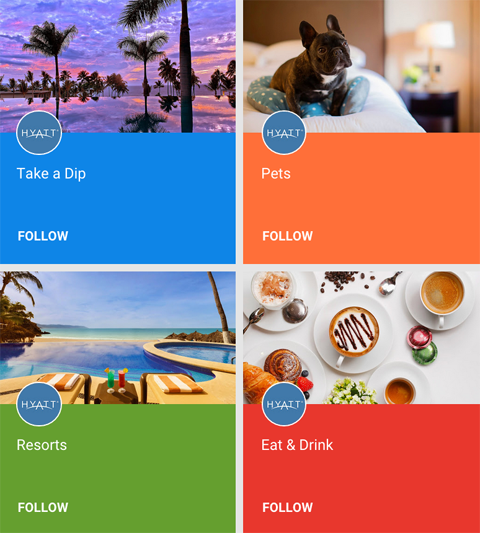 These collections help the Google+ followers find the hotels with specific amenities they want, such as pet-friendly locations or locations with the best food. Major publications typically have dozens of posts on a daily basis, which can become overwhelming for their audience. BuzzFeed uses their Google+ collections to sort their latest news by specific topics. 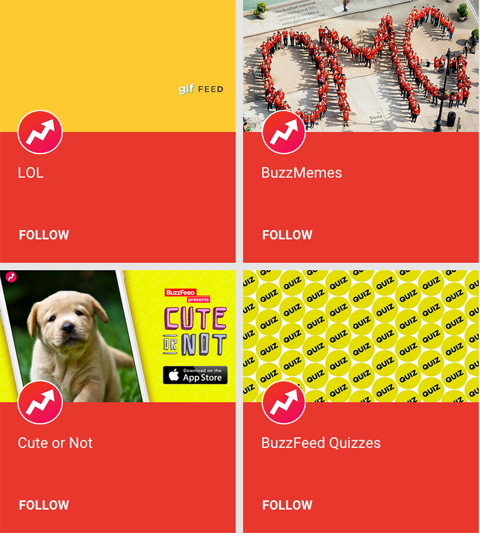 BuzzFeed’s collections sort news into different topics. These collections let Google+ followers subscribe only to the updates they’re most interested in and avoid being overloaded by the rest. Do you like to participate in Monday Motivation, Throwback Thursday or other weekday memes? If so, you can use Google+ Collections to organize your meme posts, like Simply Audrey Cat. Simply Audrey Cat has collections for weekday memes. These collections demonstrate to your followers that you like to have fun with your Google+ page, and that you’ll be updating most days of the week. Ready to create collections like these for your Google+ personal profile or business? Here’s what to do. Create your first Google+ collection. Image: Placeit. 1. 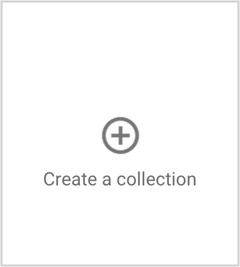 Go to the Google+ Collections page and click on the Create a Collection button to start a new collection. If you’ve previously created a collection, you’ll see the screen below instead. 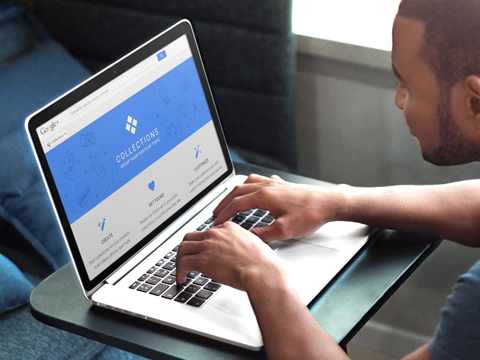 Click on the Create a Collection box to start your new collection. Click the Create a Collection button to get started. 2. Type in a name for your collection and choose to make it public or visible to specific groups of contacts (circles). Note that you can’t change the privacy setting after you set up your collection. Enter a collection name and choose a privacy setting. 3. Click the Customize link to upload a cover photo that is 1080 pixels wide by 607 pixels tall, and choose a theme color. The cover photo and theme are shown on your collection page and in the preview of your collections (as shown in earlier examples). 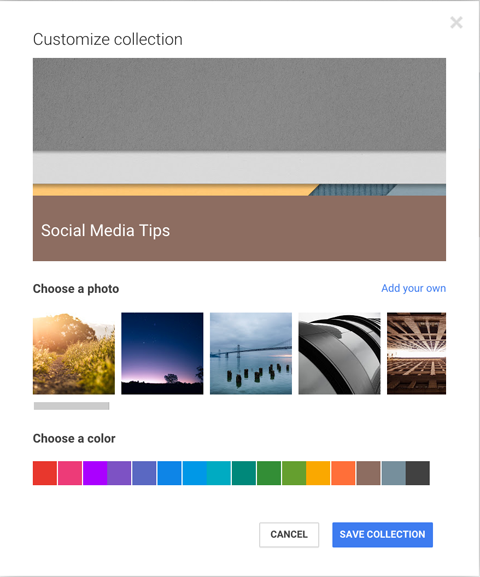 Customize your collection by uploading a photo and choosing a theme color. 4. Post updates directly to your collection pages or add the collection to applicable updates on your profile or page. Your updates will be shown in the collection and on your profile, based on the privacy settings you chose. Post updates to your collection. Use your Google+ collections like the pages shown above. Or use yours to organize different types of content such as blog posts, podcasts, videos, white papers, infographics, etc. The options are endless! What do you think? Are you using Google+ Collections? If so, please share how you use them in the comments! Google+ collections image created with Placeit. 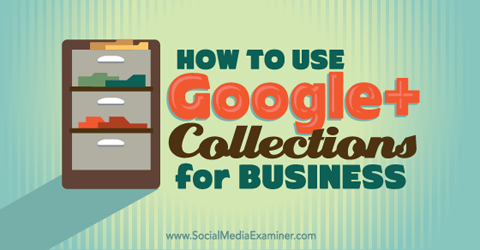 Tips for using Google+ Collections for business.